Regis High School's REACH Program was recently featured as a cover story in the Greater New York section of the August 19 issue of The Wall Street Journal. Below is an excerpt of that article. View the complete article on The Wall Street Journal website. For a long time, competitive high schools have laid much of the blame for their lack of diversity on the difficulty of finding more black and Hispanic students with the academic skills to thrive. Leaders of a selective Jesuit high school on the Upper East Side say they have figured out a way: Recruit them in fifth grade. 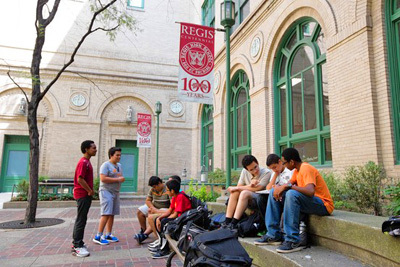 Every year, Regis High School picks about 40 fifth-grade Catholic boys with promise for an intensive boot camp that includes four years of summer school, plus Saturday classes every fall and spring. At the end, usually about a third of them have the grades, test scores and commitment to get seats at Regis.